Most people developed extra body fat over time due to their sedentary lifestyle. If you have gained fat too you should know that you are not the only one. Do you know what is the most dreadful in gaining weight? We agreed that it is fat armpits. Armpit fat are the extra fat that appears in the underarm area and prevent women from wearing tight dresses and crop tops. It is not easy to get rid of armpit fat as you should lose your whole body fat to reduce them. If you are serious and you want to begin your weight loss journey you should start with dieting and workouts. We recommend that you balance your diet with healthy foods, drink enough water and exercise regularly. 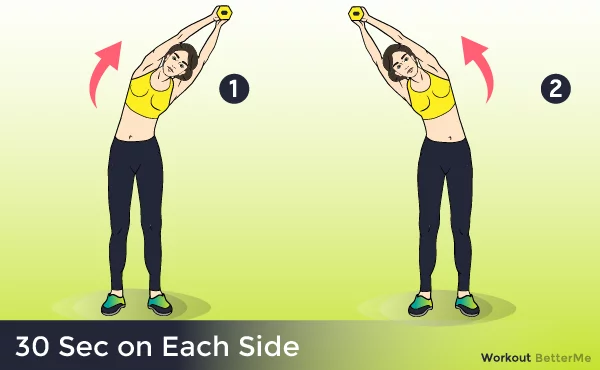 We would like to show you this effective ten-minute workout that can help you remove armpit fat for good. You are able to do these exercises at home. This training routine consists of fat burning moves such as arm circles, bent over rows, push-ups, biceps curls, triceps extensions, lateral raises, front raises and bent over lateral raises. This training routine is aim to tone your body and strengthen chest and arms muscles. Each exercise should be repeated fifteen times. You should perform this workout five times a week combining it with cardio routine. In order to start exercising you will need to have a set of light five pound dumbbells. Are you ready to try it? Scroll down to learn how to do these moves correctly in order to avoid injuries. It is time to stop making excuses and start sculpting the body of your dreams. You can do it!